Upregulation of IL-6 cis- and trans-signaling pathways in PA-SMCs and lungs of patients with iPAH as compared with control patients. 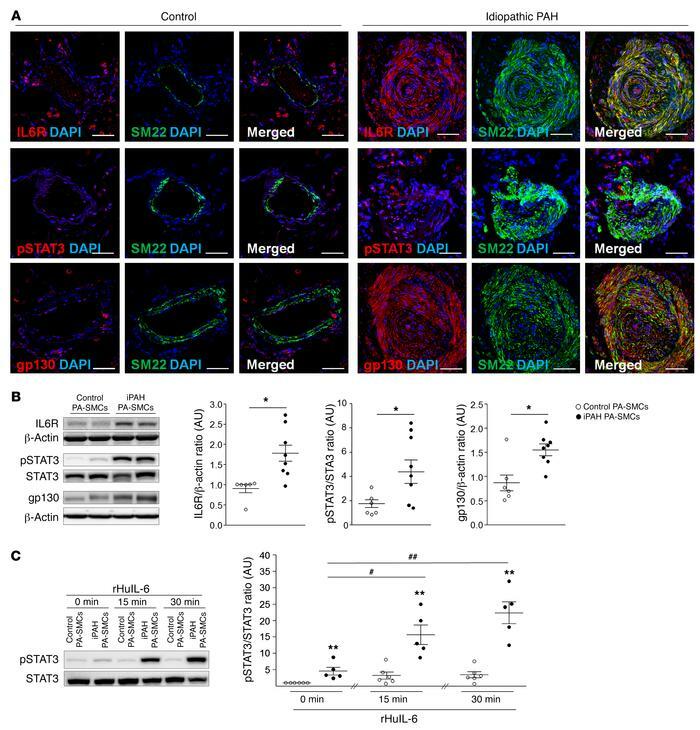 (A) Double staining with IL6R, pSTAT3, or gp130 with SM22 and DAPI in lungs from control subjects and iPAH patients (n = 7). (B) Representative Western blots and quantification of IL6R/β-actin, pSTAT3/STAT3, and gp130/β-actin ratios in human pulmonary PA-SMCs derived from control subjects and iPAH patients (n = 6–8). (C) Representative Western blots and quantification of pSTAT3/STAT3 ratio in human pulmonary PA-SMCs derived from control subjects and iPAH patients exposed for 0, 15, or 30 minutes to rHuIL-6 protein (n = 5–6). Scale bars: 50 μm. Data are presented as mean ± SEM. Comparisons were made using the nonparametric Mann-Whitney U test or 2-way ANOVA with Bonferroni’s post hoc tests. *P < 0.05, **P < 0.01 versus control PA-SMCs and versus control PA-SMCs at 0 minutes; #P < 0.05, ##P < 0.01 versus iPAH PA-SMCs at 0 minutes.